This mitered frame layout pattern was created for the Scrap Happy Sampler Quilt, but works for any twelve 12" square quilt blocks. The setting in technique is used to sew mitered frames around each of the twelve blocks. An alternate layout option surrounds twelve quilt blocks with patchwork sashing and cornerstones. There are several ways to miter corner seams. One mitering method uses too-long strips that are sewn to the sides of a block (or quilt) and then stitched on the diagonal at the corners. If you are accustomed to that method, and your blocks are all the same size, with no variations, do put it to use with this quilt. However, the oversize strip technique does not help you square up the sides of a block that is skewed a bit or standardize blocks that aren't quite the same size, so we'll use a different method for this layout pattern. Cutting frames to their 'textbook' size helps to ensure that framed quilt blocks are ready to sew together when it's time to join them into rows. 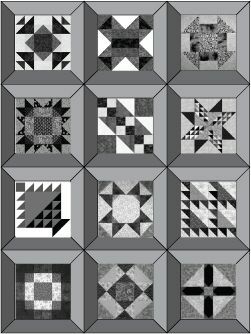 If your quilt blocks are different sizes, work on them a bit before you begin by using one or more of the techniques in my article about fixing problem quilt blocks. Often, all it takes is a thorough pressing to bring the blocks up to their correct size. Setting-in is not difficult -- beginning quilters won't have a problem if they work slowly and methodically, but it's important to know where seam intersections are (or should be) at the corners of a block and on the inner edge of each frame. Yardages will vary. If you choose to sew your block frames with only two fabrics, one darker than the other, you'll need about 1-1/2 yards of each. Read the entire pattern before you make fabric decisions. Binding: about 270 running inches of double fold binding. Binding can finish at 1/4" or wider since there are no block areas that will be chopped off around the quilt's edges, but a too-wide binding may detract from the light/dark shadowing. You can also use split the binding to match the dark and light areas on each side of the quilt. Each quilt block is surrounded by four mitered frames -- 48 frame strips in all. The image above left is a preview of a quilt with frames made in two color values -- half of the frames darker than the others. The image above right illustrates how the quilt might look if you vary the values of some frames. Download the Frame Template PDF File. Print two copies of the file at 100% -- do not allow your printer to scale the image, which is one-half of a mitered frame. To begin, cut frames for only one block. Never cut all fabric for a quilt until you have completed a test block. Cut selvage width fabric strips that are 3-1/2" wide. Tape two of the frame images together along their straight edges (tape in back and front to make edges flush -- do not overlap). Place the template along a fabric strip, matching lengthwise edges. Mark the angled ends. Flip the template around and mark another frame, matching angles to conserve fabric. Cut along the angled marks. Place the template back onto a frame and mark the seam intersection at each short end on the reverse side of the fabric. Continue cutting and marking frames until you have a total of 48 -- colors and values will depend on the arrangement you've chosen. Mark the four-seam intersections at each quilt block's corners. Avoid simply measuring 1/4" inward unless you know your blocks are accurate. The squaring-up article mentioned on page 1 should help you prep blocks that are a bit off. Arrange your quilt blocks into four rows of three blocks each, leaving about 4" between all blocks. Place frames on each side of all blocks. Darker frames should be on the same two sides of all blocks, but they can be positioned differently than frames in the illustration. Experiment with values until the layout suits you. Before you begin, fold each frame in half crosswise to find its midpoint. Mark that point on the frame's reverse side. Also, find and mark the midpoint along each (front) side of all quilt blocks. Sew two adjoining frames together along their 45-degree ends, beginning at the outer matched edges. Stop sewing at the inner marked seam intersection. Backstitch and remove from the machine. Press the seam open. Use the same technique to join the two remaining frames for the same quilt block. Place the block right side up and position a frame duo on top, right side down. Pin-match the marked midpoints and seam intersections. Before you sew, check to make sure your frame is oriented as desired. Begin sewing at the marked intersection at the open end of a frame, with the frame on top as you sew. Backstitch and continue sewing. Stop sewing when you reach the seam intersection on the opposite side where the slit appears in the seam used to connect the frames. Leave the unit in the machine and keep the needle down. Raise the presser foot and pivot the unit. Match and pin seam midpoints and intersections at the ends of the frame and the block and then match edges along the entire length. Continue sewing, ending the seam at the marked intersection. Backstitch and remove from the machine. Press seam allowances towards the frames. Sew the second frame duo to the block in the same way. Press new seams towards the frames. Repeat to add frames to all blocks. Place your blocks back into the layout -- four rows, each with three blocks. Sew blocks in each row together along their sides. Press new seam allowances in adjoining rows in opposite directions. Sew the rows together and press the quilt.